I’ve probably eaten 15 pints of ice cream already after missing the 100-pip move on GBP/USD by TWO measly pips! Ugh! But I have a plan… I hope it’s not yet too late to jump in on the trend. The pair did get rejected at last week’s resistance area just like I hoped it would. Sadly, my trade didn’t get triggered as price only went up to 1.6268 and my order was at 1.6270. But let’s not dwell on my sob story. 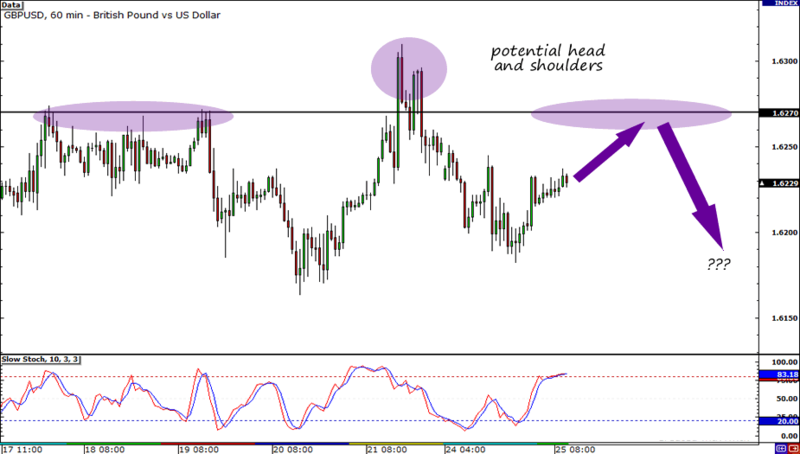 Looking at the 1-hour timeframe, a head and shoulders chart pattern has materialized. And you know what, price just closed a below the neckline support! 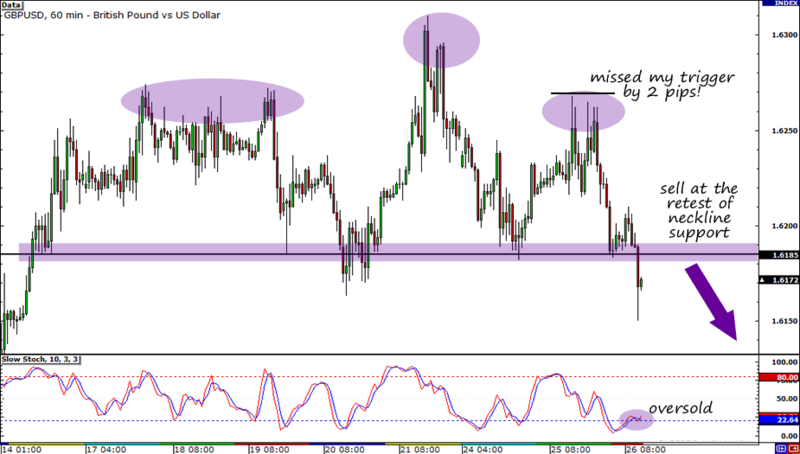 I plan on jumping in on the trend when GBP/USD tests the previous support area for resistance around 1.6185. Stochastic indicates that the pair is still oversold which suggests that I could get in at a better price if I just wait a little. I’ll place my stop well above the Tokyo session highs at 1.6235. Short GBP/USD at 1.6185, SL at 1.6235, PT1 at 1.6100, PT2 to be determined. Risk disclosure. I’m hoping to bounce back from my loss last week with this trade on GBP/USD. I spotted setups on both the daily and hourly timeframes. Are you with me on this? I fell head over heels for this setup on GBP/USD almost as soon as I laid eyes on it. On the daily time frame, the pair has formed reversal candlesticks around its previous high, suggesting that it will soon trade lower. I then zoomed in to the hourly time frame. 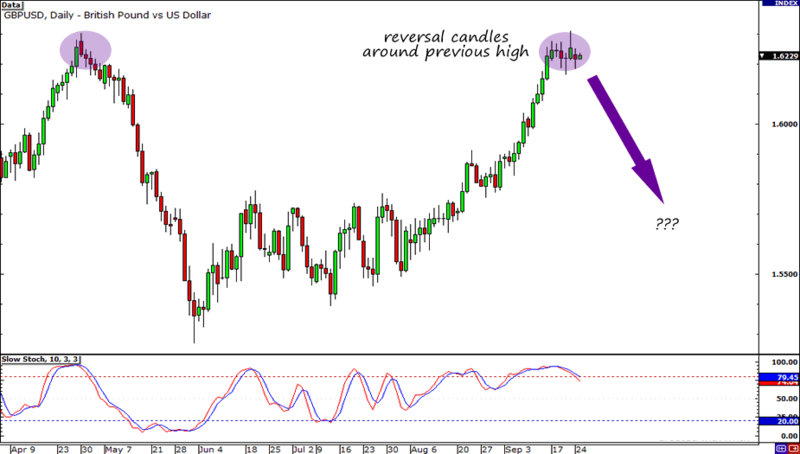 To my surprise, I spotted another bearish setup that made GBP/USD look even sexier! Price is slowly creeping higher and it looks like it would soon test resistance at 1.6270. If the pair finds resistance there again, we’ll see a head and shoulders chart pattern–a formation that is widely considered bearish. Should my trade get triggered, I’ll place my stop at 1.6325. I believe it’s a good area to consider my trade as invalidated as it’s well above last week’s high. I plan on taking profit on half of my position at 1.6170. As for the other half, I will keep it open until the downtrend lasts. Fundamentally, it seems that we’re seeing a return to economics. Market participants are starting to realize that the all the stimulus measures that central banks from all over the world are nothing to be happy about. They were started because the economy was in the dumps, and that’s not something to be optimistic about. The Bank of England (BOE) meeeting minutes released last week also showed that the central bank is open to further easing if the economy further deteriorates or doesn’t get better. As we have seen in the past, quantitative easing has been bearish for the pound. Finally, I think that the rally in risky assets like the pound is severely overdone. The market will have to correct itself soon. Short GBP/USD at 1.6270, stop at 1.6325, PT1 at 1.6170, PT2 yet to be determined. Risk disclosure.